You have reached William Witney's collection of videos. Please scroll down and click on the text or picture and it will take you to the appropriate VIMEO or You Tube page. Additions and updates to this page is an ongoing project as we receive video footage collected by our aficionados. 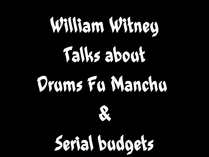 His favorite serial,William Witney talks about DRUMS OF FU MANCHU serial, directing with Jack English and serial budgets. Click here or picture to view. William Witney talks a little bit about working on the Bonanza series. Click here or on title box to the left to view video. William Witney talks about Bears. A clip from the 1992 Knoxville Film Festival, original footage courtesy of Bill Sasser. Click this text or picture to view. 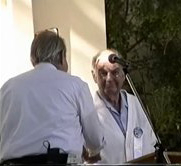 Serial, television and action motion picture director William Witney answers the question" What makes Lone Pine such a good location"?This edited clip, from the 1994 Lone Pine Film Festival star panel discussion, is from a presentation " Remembering William Witney" by his son Jay Dee Witney given at the 2014 Lone Pine Film Festival. Original personal footage from Jim Drake ( imdb.com/name/nm0236930/ ), by permission. William Witney talks about working the horse stunts for STRANGER AT MY DOOR filmed in 1956, plus working with 'REX' king of the wild horses and more. This video is from a panel duscussion taped in 1994 at the Knoxville Film Festival. Click here or picture to watch video. 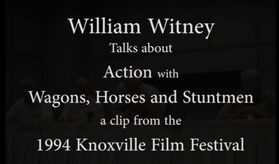 William Witney talks about Action, Wagons, Horses, Stuntmen and an accident. A clip from the 1994 Knoxville Film festival. Click here or picture to watch. 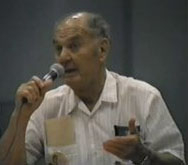 William Witney talks about Nat Levine during a celebrity panel discussion at the 1994 Knoxville Film Festival. Click here or picture to view. 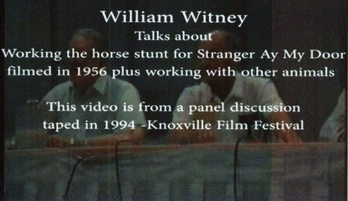 A clip from the 1988 Knoxville Film Festival, Bill Witney remembers working with stunt man David Sharp. 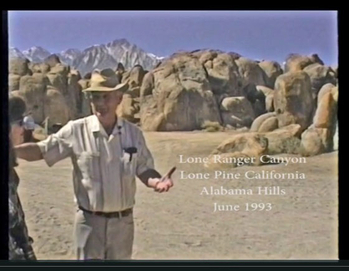 This clip is an interview with Director William Witney, from a documentary titled “ Roy Rogers King of the Cowboys”. Made for European communities, directed by Thys Ockersen, this Scorpio Film Productions was made in cooperation with NOS Television- Holandbehind your video, and how you were involved in making it. 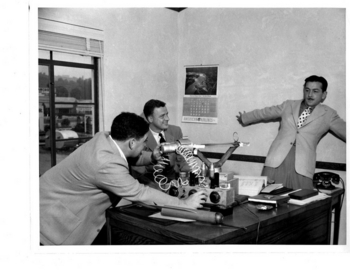 William Witney tells the Story behind the interview. This clip is from the 1992 Knoxville film Festival. William Witney tell the story behind his interview for the Roy Rogers documentary "Roy Rogers King of the Cowboys" Made for the European communities. Click here or on picture. Video footage from the Knoxville Film Festival 1990: Director William Witney, the "Arizona Cowboy" Western star Rex Allen and stunt man Tom Steele talk about making pictures at Rebublic Studios. Thank you Bill Sasser for this edited footage. 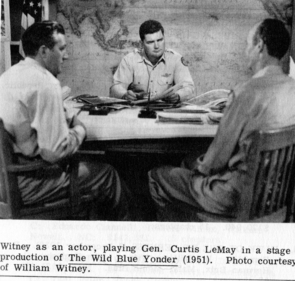 William (Bill) Witney actually started and ended his motion career in front of the camera. This is a clip from the last film he directed, Quell and Company, filmed in Mexico. When he could not find the right actor to play the part of the Sheriff he just did it himself. Serial directors Bill Witney (lt) and Jack English (rt) test out the new ray gun for the next episode. William Witney, Action-Maestro - A Biography, by Mike Haberfelner. The link below will take you to a good variety of films and serials by William Witney and Jack English. Directed by William Witney. Use the link below. Another site with a great collection of past William Witney films, this link below is worth a visit.